VISITATION~ Visitation begins at 6:00 PM Friday, February 24, 2006 at First Christian Reformed Church, 2901 East 26th Street, Sioux Falls, SD. The family will be present to greet friends from 6:00 PM to 8:00 PM. 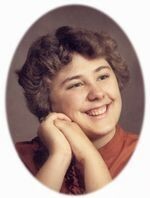 Darlene Kay VanderGiesen, daughter of Eugene and Delores (Wichers) VanderGiesen, was born July 23, 1963 at Osborne, KS. She lived with her family on a farm near Dispatch, KS before moving with them to Rock Valley, IA in 1968. Darlene attended school at Hope Haven and Rock Valley Public School. She attended high school at Iowa School for the Deaf, Council Bluffs, IA and graduated in 1983. Darlene also received vocational training at a community college in Council Bluffs. She then lived and worked in Council Bluffs before moving to Sioux Falls, SD in 1992. Darlene worked at J.D.s House of Trophies for 13 years until her untimely death. She loved her work and was proud to be employed there. Darlene was a member of Community Reformed Church. She loved to collect Beanie Babies. She cherished her cats. She also enjoyed Deaf Club, softball, camping and playing cards. Grateful for having shared her life are her parents, Gene and Dee VanderGiesen, Rock Valley, IA; her sister, Sandra Sidford and her husband, Jeff, Sioux Falls, SD; her maternal grandparents, Doc and Joyce Wichers, Cozad, NE; many loving aunts, uncles and cousins; and a host of other relatives and friends. Darlene was preceded in death by her paternal grandparents, George and Henriette VanderGiesen.